Wisława Szymborska-Włodek, Maria Wisława Anna Szymborska [viˈswava ʂɨmˈbɔrska] (2 July 1923 – 1 February 2012) was a Polish poet, essayist, and translator. She was the recipient of the 1996 Nobel Prize in Literature. Szymborska was born in Prowent. 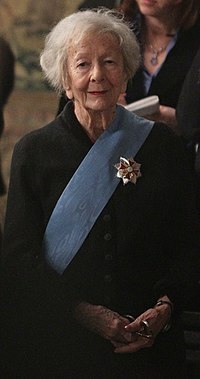 She died 1 February 2012 at home in Kraków from natural causes, aged 88. This page was last changed on 20 March 2019, at 15:57.